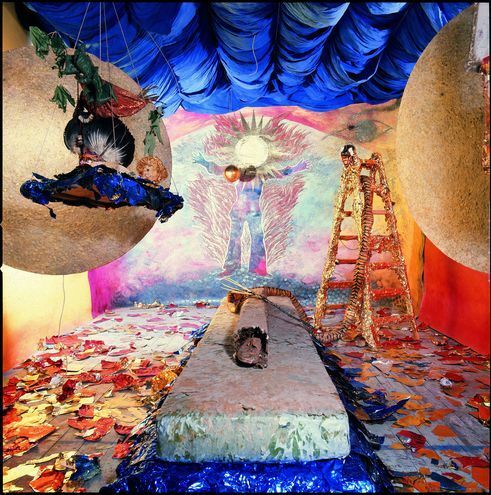 Arabian prince, magician, master of ceremonies and traveller between worlds: Michael Buthe (1944–1994) is one of the most vivid personalities of the German art scene. As a participant in Harald Szeemann’s legendary exhibition “When Attitudes Become Form” in the Kunsthalle Bern (1969) and “Individuelle Mythologien” (Individual Mythologies) in connection with Documenta 5 (1972), he belongs to a generation that turned towards mythical worlds and other cultures in the wake of the expansion of the concept of art. 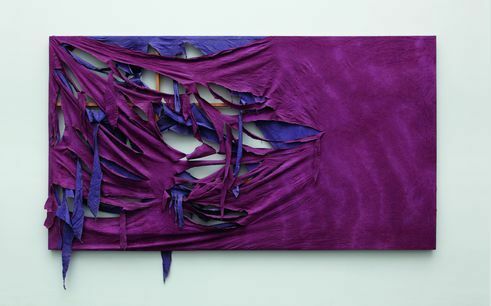 Munich’s Haus der Kunst is devoting a retrospective to Michael Buthe with works from 1960 through 1994. “A few centuries ago, a wondrous encounter took place in Samarkand, which was ruled by a wise king who generously and benevolently fostered the arts at his court …,” writes Buthe in his Hommage an einen Prinzen aus Samarkand (i.e. 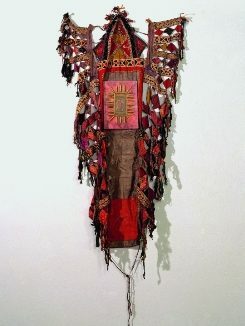 homage to a prince from Samarkand), 1977. This fairy-tale world corresponds to the spatial installation of the same name that one enters as if it were a treasure-chamber from “A Thousand and One Nights”: a fragrant interior, shimmering in red, with heavy fabrics, glittering, feathered objects, and a golden sun disc as if put aside there by chance. In this interior space, created in 1977 in the Kunstmuseum Düsseldorf, one could linger, immerse oneself, or go on playing as one touches, smells and feels, enveloped by an inviting world of the senses, liberated from practical constraints, considerations of profit and other pipe dreams of western adulthood. Michael Buthe’s work creates a vital narrative atmosphere in which colours, signs and found objects from everyday life from his own and foreign cultures are arranged into mythical symbols and play worlds. 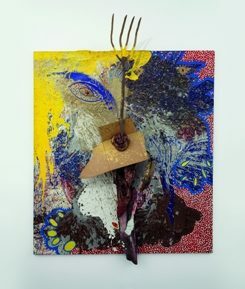 Colours, signs and forms sweep one away into the world of “Michel de la Sainte Beauté,” as Buthe, who occasionally made his appearance in eccentric feathered headgear, named himself. Starting in the 1970’s, Buthe lived between Cologne and Marrakesh, and was conceived as a wanderer between worlds just as was his contemporary Joseph Beuys. 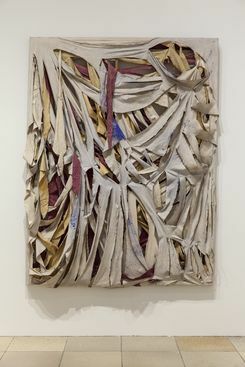 In the exhibition in Munich’s Haus der Kunst as well, fabric pictures, drawings, assemblages and spatial installations call on the viewer to set off on this journey, to open up an inner orient – on which the artist’s locus of desire lends itself as playing surface. In the installation Taufkapelle mit Mama und Papa (i.e. 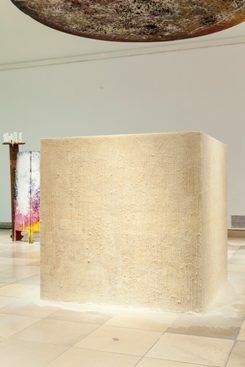 baptismal chapel with Mum and Dad) which Buthe created in 1984 for his exhibition Inch Allah in the Stedelijk Museum in Ghent, a large ashlar covered with wax forms the centre. Liquid gold paint lies on its surface – as if in a baptismal font. 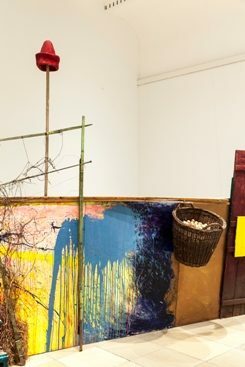 Around it a separate open space was created with expressively painted room-dividers, cardboard objects and objects from everyday life. A ritual space, religious area, but also an improvised play surface, on which the objects are left behind as vestiges of an operation. In any case, an aura of process, of improvisation surrounds the installation that allows the viewer freedom. 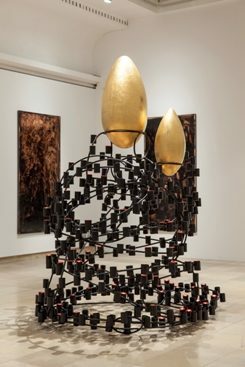 Many of Buthe’s works are conceived in terms of process, are relics of his installations and rituals, or were continually developed over the years. For instance, the work Boulli Africaa: a arrangement formed out of a wide range of objects from the African continent whose point of departure was a pair of shoes that Buthe was gifted by a friend from Senegal. In view of the artist’s at times opulent, often also contemplative and meditative, but always exotic pictorial language, the question of the manner in which „the oriental“ is processed in Buthe´s work arises. American literary theorist Edward Said stigmatised the orient as a creature that had arisen from the west’s very own fantasies and defence mechanisms. To be sure, artistic apotropaic magic against the everyday world of the occident, experienced as compulsively rational and violent is surely one motif, but both in his oriental self-presentation as well as in the intensity of his pictorial approach it is evident that Buthe conceives the foreign as an integral element of his own position. And thus it is his utterly own rituals, signs and stars from which Michael Buthe carpenters and paints his cosmology. This cosmology is not only exotic, it also represents a system of values in which spirituality, play and dealing with the unpredictable are avowed as potentials of our humanity. 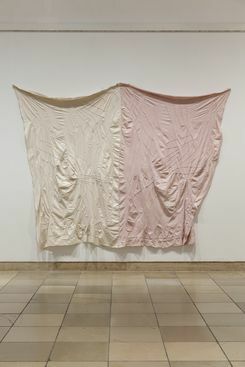 Buthe’s last large-scale installation clearly shows that his main concern was the study and plumbing of his own being. In the 14 copper plates of Die Heilige Nacht der Jungfräulichkeit (i.e. the holy night of virginity), man appears as a mysterious being, caught between the “Voraugenblick des Gezeugtwerdens und dem Nachaugenblick des Ersterbens,” – the moment before conception and the moment after the dying of the light. It is here that Buthe emerges into visibility as an artist intensely focused on spirituality and religious practice – above and beyond exotic poses. These experiences are conjoined with the artist’s journeys into the heart of an inner Marrakesh experienced as real. The Exhibition Michael Buthe took place from 8th of July until 20th of November 2016 at Haus der Kunst, Munich. At the same time his paintings, Objects and Collages were exhibited at Sammlung Goetz, Munich from July 9th until December 3rd, 2016. Natalie Göltenboth is an anthropologist, free-lance editor and author. Copyright: Text: Goethe-Institut, Natalie Göltenboth. This work is licensed under a Creative Commons Germany Attribution – NoDerivs 3.0 Germany license.